Fractals are a source of endless fascination to me. Life itself relies on many of the concepts of fractals: trees are fractal, as are feathers, coast lines, and many other things in nature. Indeed, it was the realization that landscapes are fractal that made modern animated films possible. But, what about fractional dimensions in quantum mechanics? It turns out that electrons in a Sierpiński gasket are also fractal, and that has some pretty cool consequences. A fractal is a weird beast. A line is 1D, a square is 2D, and a cube is 3D: dimensions come in integer quantities. Except they don’t. For instance, it is possible to create a shape that has a finite area, but a perimeter that is infinitely long (the construction of such a shape is pictured below). 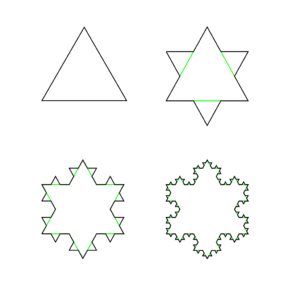 A shape with these properties does not behave like a 2D object, but it’s not a 3D object. Instead, it is a two-and-a-bit-D object. That is a fractal. 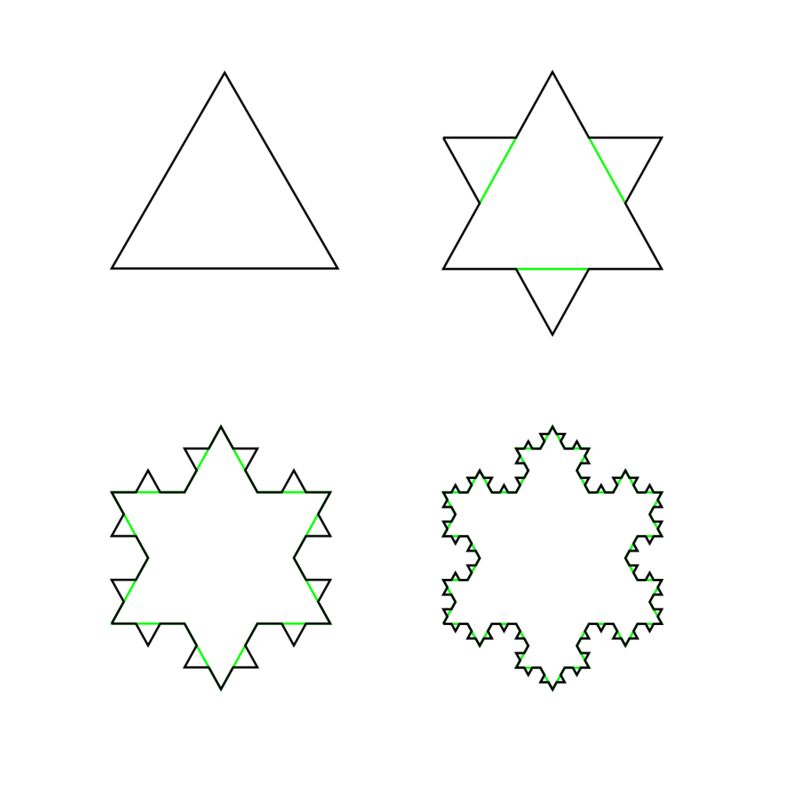 The construction of a fractal also gives a clue to another property of its nature. Zoom in on a fractal and you will find a new copy of the fractal that looks very much the same… just smaller. This is why branches look like small copies of a tree: the branching structure is a fractal. Quantum mechanics has a weird relationship with fractals. Right down at the level of atoms and electrons, there isn’t much in the way of fractals. Atoms arrange themselves in regular patterns that do not follow fractal rules. Electrons have orbits that have a nice, regular geometry. None of this fractional dimensional stuff here, thank you very much. But add a magnetic field, and that can change: the structure of the states available to electrons takes on a distinct fractal form, called Hofstadter’s butterfly. In this case, the structure of the material that holds the electrons doesn’t really matter too much; it is the interplay between how the electrons move around and the magnetic field that generates the fractal. An interesting question that arises is how electrons in a fractal structure behave? According to calculations, they should reflect the fractal nature of the structure. Observing that is difficult though. The electrons are mostly inside of materials, and the wave nature of the electron doesn’t extend very far. That means that, unless the fractal structure starts at the scale of just a few atoms, the electron isn’t going to notice the whole structure. Instead, it will just bounce off of whatever corner is nearest. Then there is the problem that most electrons can move in 3D, so the material has to be 3D. That turns out to cause problems at the scale that the electron cares about. This led the researchers to consider ultra-clean metallic surfaces and copper in particular. The electrons that travel along the surface of a metallic crystal are in a slightly different environment compared to the electrons that are in the body of the crystal. To go from the surface to the bulk (or visa versa), they need to change their energy by a reasonably large amount. In effect, this traps some electrons on the surface, creating a 2D sea of electrons. The surface electrons are also strongly influenced by contaminants placed on the surface, and this is where the new research comes in. Carbon monoxide is a very common contaminant in vacuum systems, where all this work is done. By sticking to the copper surface, the carbon monoxide modifies it. So, for our ultra-clean copper surface, sticking a carbon monoxide molecule on it is like putting a great big tree stump in the middle of an electron highway. The researchers used a very fine needle to gently push and prod carbon monoxide molecules into position on a copper surface. They were able to build up a fractal structure called a Sierpiński gasket of carbon monoxide: going from the smallest possible version (first generation), up to a third-generation carpet. After producing the carpet, the researchers used the same needle to sample the electron wave function at different locations around it. Well, more precisely, they measure the current through the needle as a function of the voltage applied, which is more like a measure of how many electrons are in the vicinity of the needle. Aside from the intrinsic coolness of the work—placing molecules with atomic precision was something unimaginable not so long ago—what have we learnt? 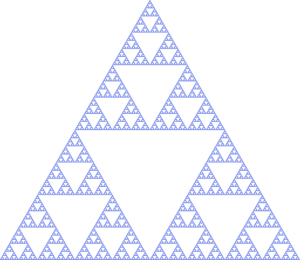 Electrons that have to live in a fractal structure take on a fractal nature as well (with a dimension of about 1.58). That means that their energy states tend to break up from a continuous set (electrons have all energies within some range), to one with clusters. For some energies, the electrons end up confined, meaning that they don’t move through the structure, and the conductivity falls. For other energies, the electrons have to follow a specific set of paths through the structure, and for yet others, the electrons can move freely. Now, given it needs a (nearly) perfectly clean copper surface, this is not of much practical use. But it does allow researchers to explore how the properties of an electron gas (or liquid) change as the dimensionality of its surroundings change gradually from 1D through to 2D.